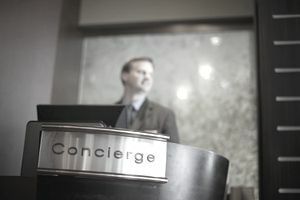 A concierge provides a variety of services to guests. Typically, concierges work in hotels, but they may also work in clubs, restaurants, and other venues. A concierge provides guests with information about locations and services outside of the hotel. They may book services for guests, such as transportation and activities. Below is a list of the top five most important skills for a concierge, as well as attached lists of related skills employers seek in candidates for concierge jobs. You can use these skills lists throughout all stages of your job search process. Your resume is the first place where you should utilize these skill words, both in the descriptions of your work history and in your opening summary of qualifications. Secondly, you can use these in your cover letter. In the body of your letter, you should mention one or two of these skills, and provide specific examples of times when you demonstrated them at work. Finally, you can use these skill words in your interview. Make sure you have at least one example for a time you demonstrated each of the top 5 skills listed here. Of course, each job will require different skills and experiences, so make sure you read the job description carefully and focus on the skills listed by the employer. Also, review our lists of skills listed by job and type of skill. 1. Communication - Communication is critical for a concierge. They speak with guests all day, so it is important that they speak clearly and maintain a positive tone and a helpful attitude. Job candidates who are fluent in more than one language will have an advantage when applying for jobs, particularly in major metropolitan areas like New York, Seattle, Los Angeles, Washington DC, and Dallas. Perhaps most importantly, being a good communicator means being a good listener. Concierges need to listen carefully to their guests’ requests to provide a positive experience for them and to proactively identify any particular support they may require. 2. Friendliness - A concierge is one of the first people a guest sees upon entering a hotel, he or she is the “face” of the organization. Therefore, concierges have to be extremely welcoming. They should greet every guest with a smile and a kind word, no matter how long they’ve worked or how tired they may be. 3. Organization - A concierge has to manage multiple tasks at once: they must serve many guests, make appointments and arrangements for people, and more. Being organized allows a concierge to juggle these multiple tasks without losing his or her cool. 4. Local Knowledge - A concierge provides guests with suggestions for entertainment and various services within the hotel itself and in the surrounding geographical area. Therefore, it is very important that a concierge know the area, its best restaurants, and most interesting attractions, and the other sorts of services available in the region. 5. Professionalism - Because a concierge is representing the hotel and is interacting directly with guests, he or she must look and act professionally. Professional attire and demeanor will make guests trust the concierge and his or her suggestions. By demonstrating your professionalism, communication skills, local knowledge, organizational talents, and friendliness on your resume and in your interview, you’re sure to impress the hiring manager as being a great choice for their next concierge.